You might ask the question, “How will this help me pocket balls?” There are in fact many answers to this question. One answer is that it becomes much easier for a player to be consistent with their visual alignment when their head is positioned closer to the cue. 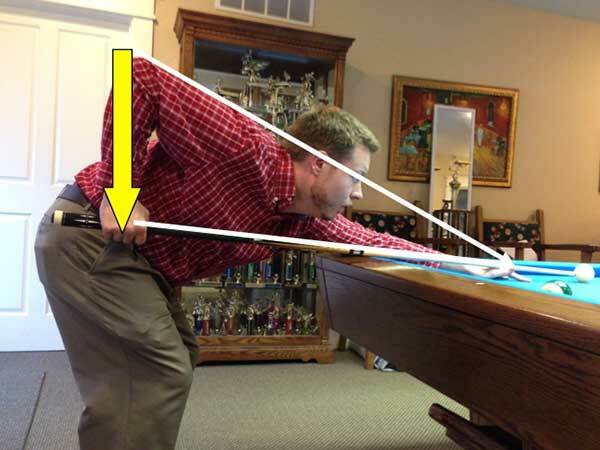 When the chin is placed near the cue, it is easier to see if you are off line. It will also allow you to visually maintain a straighter stroke. Having your head closer to the cue also allows you to sight as though you were looking down the sights of a gun barrel. If you normally have trouble pocketing long shots, you might not be bending over far enough and aiming with your dominant eye. World Champion, Luther “Wimpy” Lassiter once suggested that the key to pocketing long difficult shots is to get into your stance then crouch just a little more. 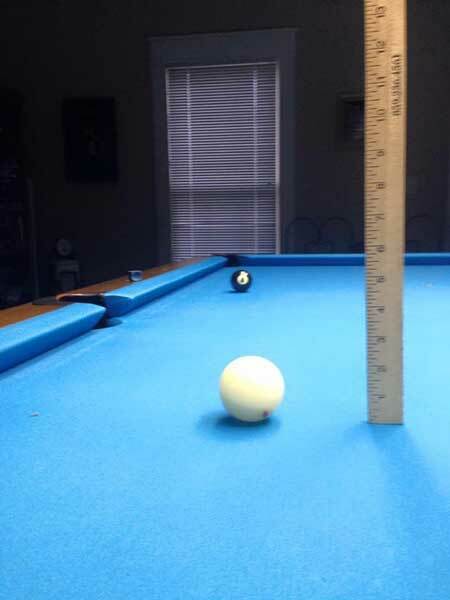 In fact, there is considerably less eye movement between the cue ball and object ball if your head is positioned closer to the cue. Snooker players have recognized this advantage for years. This is because they regularly play on 6x12 tables where long shots are the norm. The photo below shows the distance your eyes have to travel when they are positioned above the triangle (not crouched). 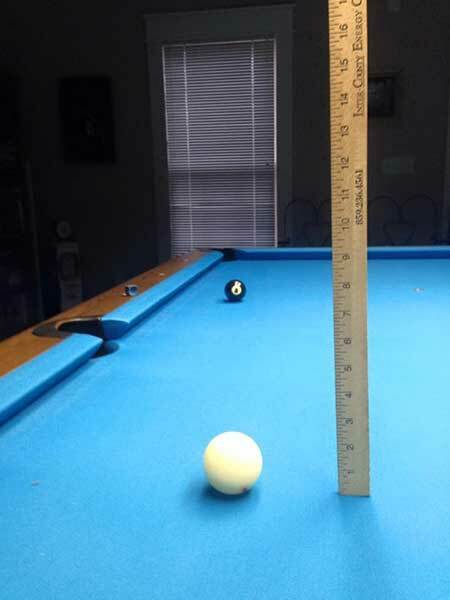 You will note that your eyes have to move around 5 inches as they transition back and forth from the top of the cue ball to the bottom of the object ball (eight-ball). Conversely, your eyes won’t have to do nearly as much work if they are located inside of the imaginary triangle (as suggested by Lassiter). Our next photo shows the same shot, but this time the player’s eyes only have to move around 2 inches (3 inches less than before). The reason for this is that the view is from a crouched perspective (inside the triangle). The overall distance will vary from shot to shot, but the distance your eyes have to travel will always be diminished as you move closer to your cue. Over the course of time this can be a huge advantage. Obviously less eye movement is better, because there is less room for error. So the next time you are faced with a long difficult shot remember to take the advice of Lassiter and crouch just a little more. Remember to practice positioning your eyes inside of the imaginary triangle. Once mastered, your eyes will do less work and you will pocket difficult shots a much higher percentage of the time.